A beautiful setting and exclusive offering make these new Maple Ridge townhomes at Village Green one of the best developments this year. An exclusive collection of country-modern Village Green Maple Ridge townhomes located within a majestic and idyllic grove setting is what home buyers can expect from this community. Surrounded on two sides by majestic trees and pristine green spaces as well as a third side protected as ALR farmlands, the new Maple Ridge Village Green townhomes is simply an amazing development. The townhouses draw architectural inspiration from the historic, English village where neighbours got to know each other and socialized with each other. Not only that, but the new Village Green townhouses in Maple Ridge also blend seamlessly into the green surroundings with lush landscaping and wide porches that lead to contemporary and high-end interior finishes that are filled with designer selected features and bright light. The actual development is situated at Dewdney Trunk and 232nd Street Maple Ridge where you will find a modern yet charming family friendly community. These new Village Green townhomes are within walking distance to the Meadow Ridge Private School and Kildare Equestrian Riding School in addition to numerous grocery stores, local amenities and walking trails. The new Maple Ridge Village Green townhomes will feature 2 level floor plans that have open layouts and upscale finishes. Best of all, homebuyers will be pleased to notice that the presale price tag is VERY affordable, with homes here starting from the $280,000s. This is an exceptional offer for first time homebuyers as well as young families looking to create friendships, start a family and share memories. More information about Village Green Townhomes is coming soon to www.villagegreenlife.ca. NEW INFO! Village Green Maple Ridge townhomes features a total of 105 three bedroom townhouses priced from the high $270,000’s range. VIP previews will begin early Fall 2013 so make sure you register early. Village Green is located at 12161 – 237th Street Maple Ridge BC and is within close walking distance to Meadow Ridge Private School and Kildare Equestrian Riding School. VIP Previews are on now for these country modern Maple Ridge townhomes located in an idyllic and highly sought after neighbourhood! Situated at Trunk Road and 237th Street Maple Ridge Village Green townhomes is all about the simpler things in life while still being connected to an urban centre. This is a place where friends families and dreams can grow generationally. It’s also located in one of the most beautiful settings in the city, surrounded by a stunning grove of Norway Spruce trees and surrounded by neighbourhood farms, nature trails and the Golden Ears Provincial Park. Also, you can watch the salmon swim upstream or join the equestrian centre for more outdoor activities. The new Maple Ridge Village Green townhomes are located next to nature, yet also close to shopping, amenities and services. The country modern Maple Ridge townhouses are at 12161-237 Street Maple Ridge and the homes provide a combination of modern comfort and country charm. Just steps away from Alexandra Robinson Elementary School in addition to Meadowridge School, children have the ability to thrive and walk to school. Also, there are numerous golf courses nearby plus local transit routes. The nine pristine acres of land that the new Village Green Maple Ridge townhome project sits upon is all about community and creating lasting values in a master planned neighbourhood brought to you by G6 Ventures and Archstone Projects Ltd. The 2 level floor plans at Maple Ridge Village Green townhouses feature three bedrooms between 1246 and 1382 square feet. Many of the new homes at Village Green are priced under $300,000 and the high-end standards include such things like quartz counters, laminate hardwood floors, stainless steel appliances, fireplaces and main floor powder rooms for extra convenience. A central courtyard called the ‘village green’ will feature an outdoor entertaining space and much more. A new Maple Ridge community has been planted. Coming Fall 2013. Surrounded by nature and pristine forest and urban green spaces, this newest Maple Ridge townhouse community is one of the best of 2013. The amazing location in a quiet yet established neighbourhood is highly sought after. The new Maple Ridge Village Green townhouses are surrounded on three sides by ALR lands and so you can walk across the street and pet horses. Huge coniferous forests surround the property and neighbourhood and it’s located at the end of a no-through lane. Great for families and pets, the new Maple Ridge Village Green townhouses will also feature a central commons with a traditional greenway with seating and barbeque area for a true established community feel. This outdoor amenity space is available year round so that you can socialize with your neighbours as well as entertain friends and family. Inspired by the warmth and historic charm of an English country village yet boasting distinctly modern, urban sophisticated interiors, the new Maple Ridge Village Green townhome community is something special and something very unique to the Lower Mainland. The collection of 2 level, 3 bedroom townhouses could be what you and your family have been waiting for! The floor plans are designed to be wider than traditional layouts, so the residences at Village Green in Maple Ridge feel more like single family detached homes than they do townhouses. The extra space and width also gives you more storage space and functionality such as a main floor powder room, a larger back yard and even a traditional front porch to welcome you home. The family oriented neighbourhood is great for families with children of all ages as well as pets. In addition, the attached garages directly open onto the main level which is very convenient. The floor plans will have tonnes of storage space as well as space to grow. The ensuite bathrooms will be larger than normal and the living space will be great for entertaining throughout the year. The oversized windows and over height ceilings will give you a sense of airiness and brightness not seen in traditional townhomes. In addition, the Village Green Maple Ridge townhouses will feature 3 bedrooms which will give you plenty of options and flexibility. A new community has been planted in a prime Maple Ridge real estate district. 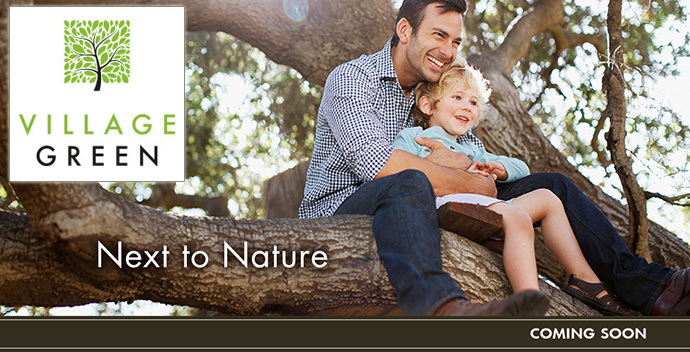 Surrounded by trees and nestled in a pure natural setting and close to local amenities, Village Green Maple Ridge real estate community offers the best of all worlds. A community of 3 bedroom exclusive townhouses is coming Fall 2013. The country modern townhomes at Village Green Maple Ridge are located in a majestic, natural grove setting in the heart of the city. The lush landscaping and wide porches lead into truly modern and design savvy interiors that are filled with natural light and finished with natural and healthier materials and finishings. The family and pedestrian friendly Village Green Maple Ridge townhouse community is charming, traditional yet contemporary and will be within close proximity to the area’s many top ranked schools, grocers, trails and outdoor recreation. This is where families and dreams can grow for generations to come. Please register for more information about the presale Maple Ridge Village Green Townhome project online now at www.villagegreenlife.ca. The anticipated launch is Fall 2013.